Anti-Israel protests and demonstrations were held throughout the United States following the start of the Israel-Gaza conflict earlier this month. 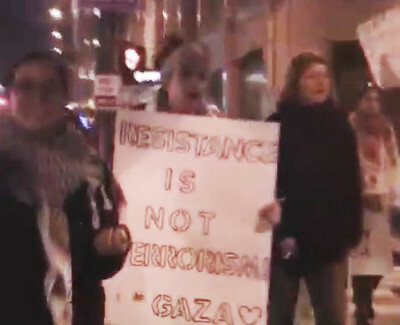 On Wednesday November 21st Al-Awda The Palestine Right to Return Coalition's Cleveland, OH chapter organized a rally in downtown Cleveland calling for the destruction of Israel. Al-Awda is a radical Palestinian organization dedicated to advancing the agenda that the Israeli state should not exist. Al-Awda advocates "the rights of all Palestinian refugees to return to their homes and lands of origin, and to full restitution of all their confiscated and destroyed property," according to the organization's website. The group's logo is a picture of the map of Israel and a key. "When people are occupied, when people are occupied, resistance is justified. When people are occupied, resistance is justified. When people are occupied, resistance is justified. When people are occupied, resistance is justified . Free free Palestine. Free free Palestine. Free free Palestine." "From the river to the sea Palestine will be free. From the river to the sea Palestine will be free. Come on I can't hear you. From the river to the sea Palestine will be free. From the river to the sea Palestine will be free." "Israel is a terrorist state. Israel is a terrorist state. Israel is a terrorist state. Israel is a terrorist state. Free free Palestine." 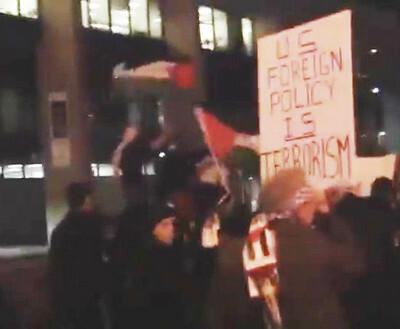 Marchers carried signs with radical slogans including "U.S. Foreign Policy is Terrorism" and "Resistance is Not Terrorism." Chants at the rally were led by Abbas Hamideh, coordinator of the organization's Cleveland chapter and co-coordinator of Al-Awda. Hamideh tweets under the name "Resistance48." On Monday, Hamideh tweeted: "When people are occupied resistance is justified." He also wrote on his Twitter account Monday: "Jerusalem is the capital of Palestine that includes Haifa, Yaffa, Akka, Deir Yassin & the rest of Palestine not simply the West Bank & Gaza." Hamideh tweeted on Friday: "If you're not for the Palestinian Refugees Right of Return I have no interest in any "dialogue" with you because it's useless otherwise." The same day of Al-Awda's rally, a Tel Aviv bus was blown up in a terrorist attack, wounding at least 28. Later that day Israel agreed to a ceasefire with Hamas, brokered by the United States and Egypt. The ceasefire put an end to Israel's Operation Pillar of Defense, which successfully destroyed thousands of Hamas rockets and command centers of the terrorist group in Gaza. More than 1,500 rockets were fired into Israel during a period of eight days, leading to the death of six Israelis and wounding hundreds. A barrage of rockets fired into Israel's Southern cities following the declaration of the ceasefire. While the ceasefire did not deter terrorist organizations from continuing to attack innocent civilians in Israel, it did not deter radical groups in the U.S. such as Al-Awda from attacking Israel. "Just because there's a cease-fire, doesn't mean the siege has ended," Hamideh was quoted as saying. "It was discovered or published that a lot of the interviews that Muslims believed they were going into with the FBI, it turns out it wasn't with the FBI at all," and "Guess who it was? Mossad, Israeli intelligence in New York and New Jersey." "Those murdered in #Gaza & in #Egypt were killed by the same system, the same agents & networks of oppression...my love to the resistance"
Deek was a high profile U.S. activist with Viva Palestina, an organization that has delivered millions of dollars to the Hamas regime in Gaza. At a Viva Palestina event in Brooklyn on July 3 2009, Deek said when the Palestinians elected Hamas "what they chose was one united Palestinian state on all of the 1948 territories from the north to the very south." In February 2010 Al-Awda's New York chapter hosted a fundraising event for Viva Palestina featuring British MP George Galloway, the leader and brainchild of the group. Al-Awda has a track record of anti-Israel activity. In April 2001, Al-Awda held a "Right of Return" rally in New York which boasted a gathering of approximately 8,000 people. According to Al-Awda's website, the rally "included statements from the Intifada leadership, the National and Islamic Forces in Palestine, and other expressions of solidarity. The rally also included a live feed with a simultaneous rally in Nazareth and with George Habash, former Secretary General of the Popular Front for the Liberation of Palestine." Al-Awda's recent Cleveland rally and the language used by Hamideh and Deek emphasize that Al-Awda has not swayed from its original objectives: advocating for the destruction of the Jewish State of Israel.